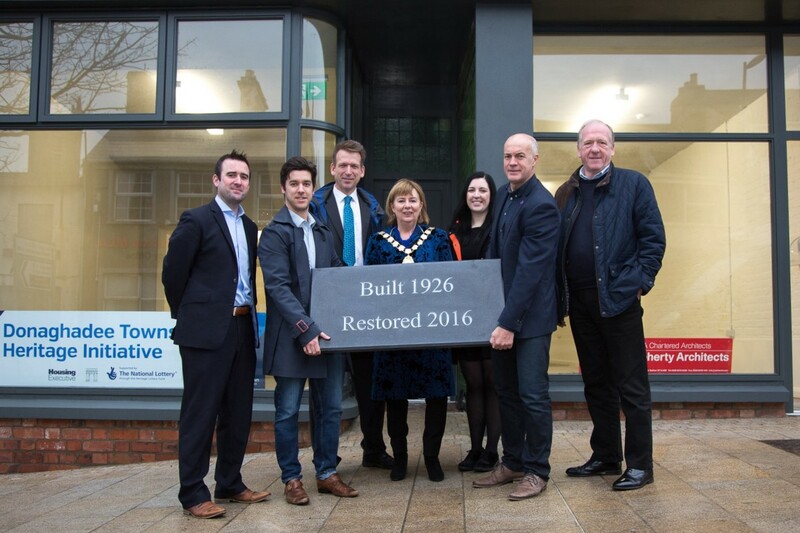 The first building to be restored under the Donaghadee Townscape Heritage Initiative (THI) - a £2.5 million heritage-led scheme to regenerate buildings within the historic town centre of Donaghadee - is now completed. Originally built in 1926, the building at 4 High Street features art deco detailing, an oculus and glazed tiling. Thought to have originally been occupied by a fruitmonger with living accommodation at first floor, the building had been significantly altered by previous owners and its condition had deteriorated to the point that much of the building was vacant and uninhabitable. Thanks to funding through the Donaghadee Townscape Heritage Initiative from the Heritage Lottery Fund and the Northern Ireland Housing Executive, the building has been restored and now provides two fully refurbished retail units at ground floor and a contemporary two-bedroom apartment with mezzanine at first floor. This is the first of 12 schemes currently being developed through the Donaghadee THI which will contribute to the economic and physical regeneration of Donaghadee town centre primarily in High Street, New Street and Bridge Street. “HLF investment goes well beyond the bricks and mortar of a building. Our regeneration grant programmes such as Townscape Heritage can really help turn around local economies, not only by improving how places look and feel but by creating new opportunities for those who live and work there. The first building completed is always a significant milestone in TH schemes and we congratulate the Donaghadee team on reaching this point. We look forward to the seeing the next buildings moving forward. We are delighted that over the last 21 years, National Lottery players have helped to safeguard the heritage of our conservation towns and cities by investing £21m to improve the quality of life for people across Northern Ireland. “The aim of the Heritage in Housing’ initiative is to reinstate empty properties, addressing blight and promoting affordable housing within town centres. “A list of 65 potentially suitable properties across Northern Ireland were shortlisted, with 15 properties selected for refurbishment. By investing in empty properties in urban areas, this will stimulate economic activity with areas populated after business hours. Donaghadee Townscape Heritage is being led by Ards and North Down Borough Council through the Donaghadee Town Steering Group in association with Donaghadee Community Development Association. For further information contact Nick Brown, Townscape Heritage Initiative Officer on 028 9188 9637 or nick.brown@ardsandnorthdown.gov.uk. Photo Caption: (left to right) Mark Cunningham, Dixon’s Contractors; Jonny Spence, Lee Doherty Architects; Nick Brown, THI Project Officer for Ards and North Down Borough Council; Mayor of Ards and North Down, Alderman Deborah Girvan; Cathy Wright, Northern Ireland Housing Executive; Lee Doherty, SDL Property Partners; Councillor Gavin Walker, Chairman, Donaghadee Town Steering Group.